Pharyngitis. EBSCO DynaMed Plus website. 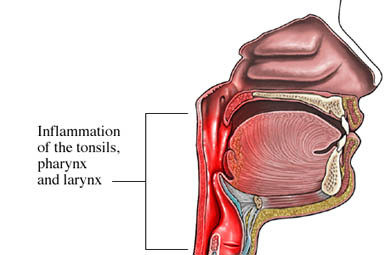 Available at: http://www.dynamed.com/topics/dmp~AN~T114913/Pharyngitis . Updated August 25, 2016. Accessed September 27, 2017. 11/10/2009 DynaMed Plus Systematic Literature Surveillance http://www.dynamed.com/topics/dmp~AN~T474266/Steroids-for-pharyngitis : Hayward G, Thompson M, Heneghan C, Perera R, Del Mar C, Glasziou P. Corticosteroids for pain relief in sore throat: Systematic review and meta-analysis. BMJ. 2009;339:b2976.